Painting for others, bringing the light and beauty into your home, is a personal joy and mission. I specialize in collaborating with clients to customize art that works with any home or business setting. My goal is to create fine art paintings that become heirlooms you and your family will enjoy for generations. Commission is discussed in person, by phone or email. Resource photos are provided by artist and/or client. Compositional drawing is reviewed with client. Contract is drawn up with a schedule of completion. Commission is personally delivered or shipped to client. Marc and Carolina met me at the Cottonwood Art Festival in Richardson, Texas a couple of years ago. She wanted an inspirational painting for their living room and envisioned a sunrise above a tropical mountain range in her beloved native country – Colombia, South America. After looking through numerous photos, she selected a beautiful sunrise and the Antioquia Mountain Range near Medellín. Here is the “rest of the story”. 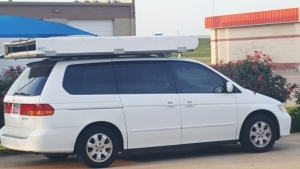 William worked very hard for weeks designing and building a cargo container to sit on top of our Honda Odyssey to accommodate this 4.5′ x 8′ painting for its road trip from Phoenix to Dallas, Texas. He thought through everything he could to make it travel worthy and aerodynamic. He even designed and welded a metal frame upon which this container would sit with both parts attached to the vehicle’s roof rack. It was a beautifully designed and built cargo container, lined with indoor/outdoor carpeting. What we did not expect was to be driving through the worst thunderstorm in El Paso I have ever encountered in the 20 some years of doing art shows in Texas!! William was anxious the entire container would fly off the car. I was scared the painting would get wet, be ruined and there would be hailstone damage to our vehicle. We were very fortunate the hail stones that hit us were the size of marbles. We later heard another area close to El Paso was hit by softball sized hail!! All of our anxieties were wiped away when William pulled the painting out of the cargo container for the owners’ first viewing, outside their Dallas home. Their glorious response was, “we love it, it’s perfect!”. To witness their heart-warming reaction was worth all I had experienced in creating the painting, William’s work in building the cargo container and the harrowing drive through the extreme thunderstorm in the El Paso area. Jim and Pam commissioned me to create a painting for a custom built, second home in Prescott. 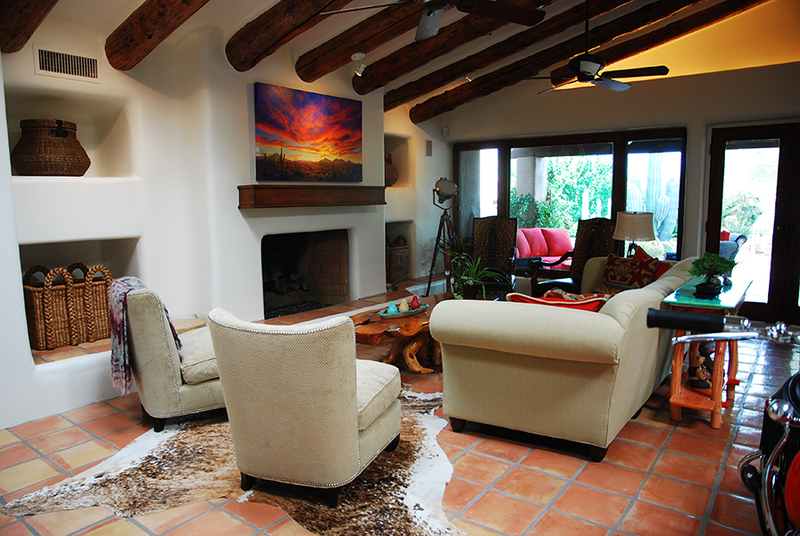 The art collection in their Scottsdale home includes three of my paintings commissioned by them as well. 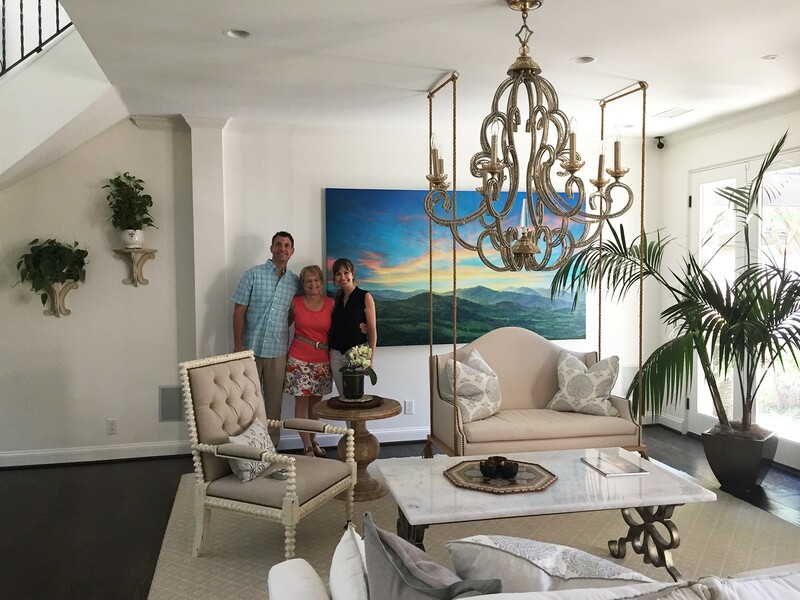 Upon visiting their home in Prescott, we determined the perfect size for a framed painting to be featured on a large wall in their master bedroom. After looking through numerous photos, in unison they excitedly said, “that’s the one!” when viewing a tranquil scene of the Granite Dells area. Pam requested a sunburst on the horizon. 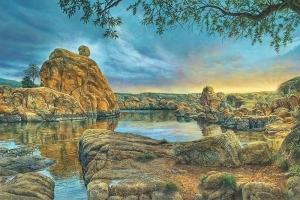 A luminous sunrise replaced the stormy sky at the Granite Dells, which required alterations in the patterns of sunlight and shadow and in the water reflections. These outstanding rock formations offered me the unique opportunity to use new tools to create a textured, multi-layered technique which was exciting as well as challenging. Jim and Pam love the serenity of their painting. “It is warm, comforting and so very beautiful” are sentiments they have shared with me. It makes me one very happy artist! 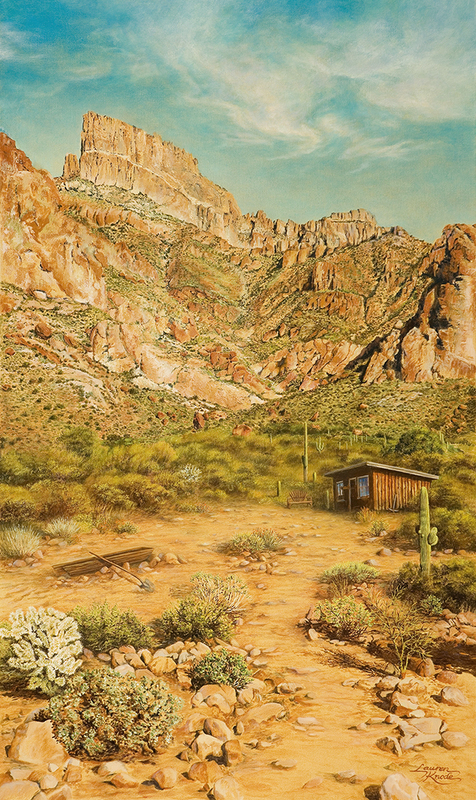 Jim wanted a painting depicting The Superstitions to the east of Phoenix, looming right outside his living room windows. His home, at the base of these mountains, was built on the site of an old miner’s cabin. A chair and sluice built by the miner remain on his property. My challenge was to create a unique composition using numerous reference photos I took at his home. 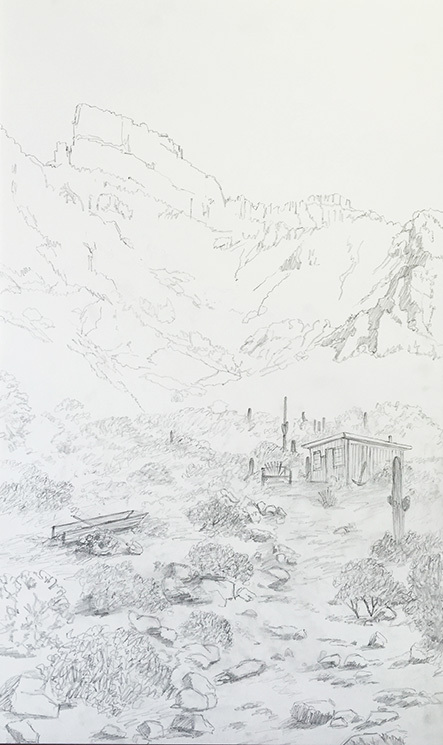 Jim made his selection, shown above, from two compositional drawings which combined all these elements plus a miner’s pick and shovel. The rock formations, painted with small palette knives, took many weeks to complete. Jim was thrilled and said my painting exceeded his expectations. 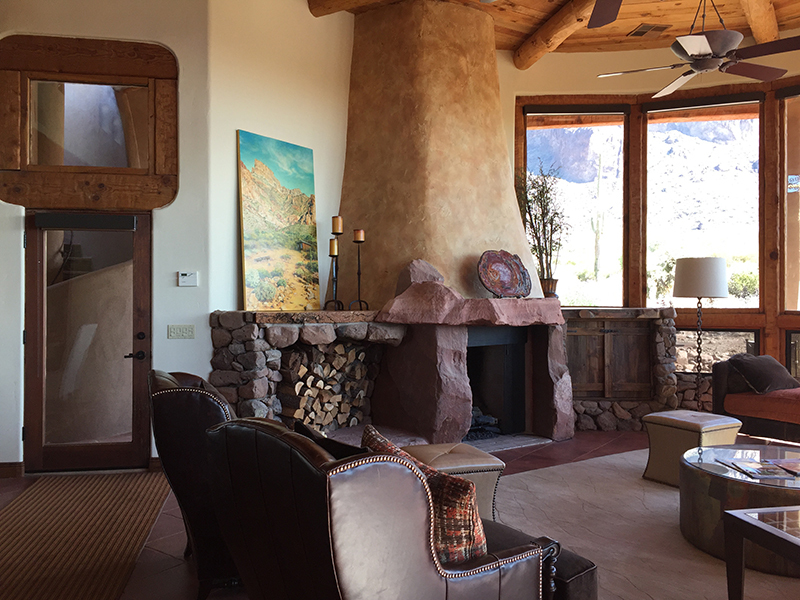 Cary and Anne were interested in a Southwest landscape for a colorful focal point above their fireplace in their living room. 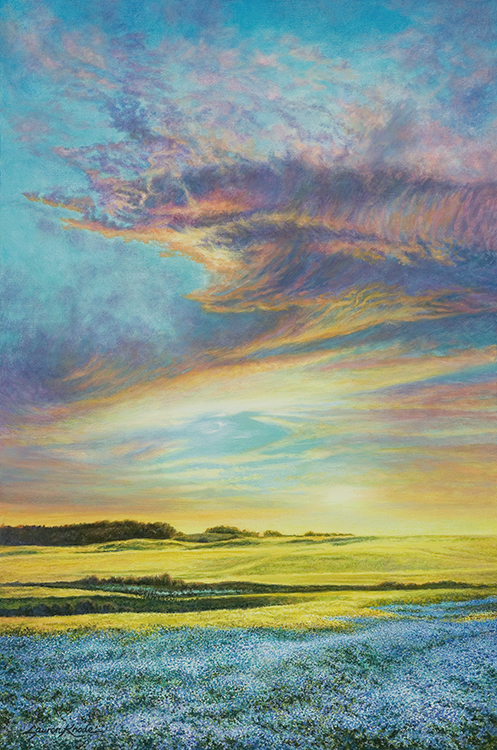 They met me at the Arizona Fine Art EXPO, painting a brilliant sunset sky for a client’s home in Las Vegas. They loved the vibrant palette. I visited with them at their home in Northern Scottsdale to determine a painting size, discuss their vision and take photos. Recently remodeled , their beautiful home was featured in “Phoenix Home and Garden”. 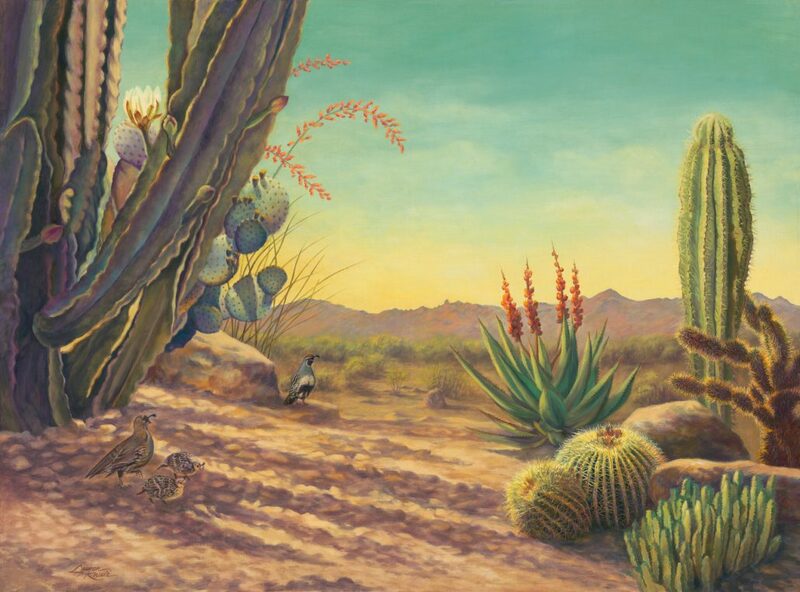 New landscaping included remarkable Southwest botanicals and cactus specimens, some of which appear in their painting. They chose Pinnacle Peak and adjoining mountains to frame their sky. A Gamble quail views it all. 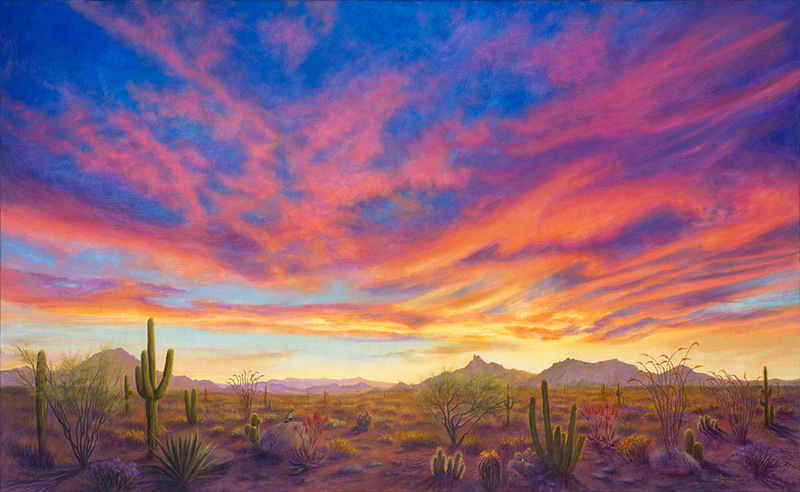 My goal was to create for them a vibrant painting depicting the incredible beauty and serenity of the Arizona desert. Dave and Debbie purchased a second home in Northern Scottsdale and were looking for a prominent painting for their living room. Visiting the Arizona Fine Art EXPO, Debbie saw a painting of mine that she said was just what she was looking for. However, instead of a vertical orientation, they wanted a horizontal painting for the space they had in mind. I assured her I could paint something similar. 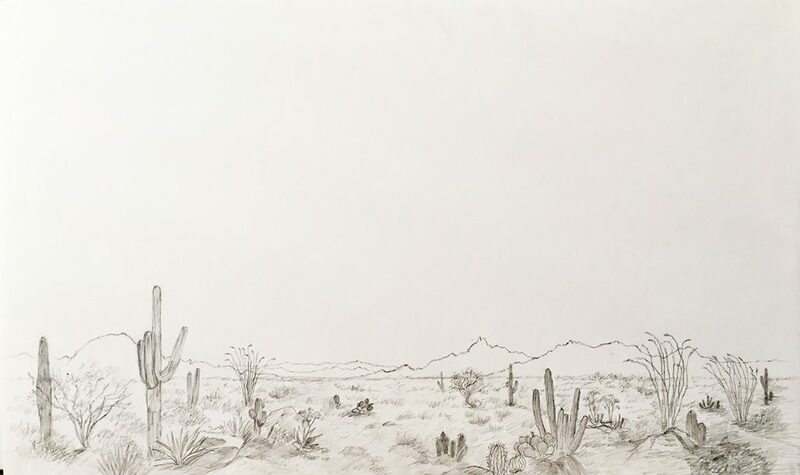 After visiting their home, we agreed on the best size for their painting and I took photos of desert botanicals in their landscaping to include in the painting. Next came my compositional drawing, their approval, and the painting was started. After an extensive search, a barn wood frame became the perfect complement for the painting and the interior of their home.